The year 2018 is drawing to a close, and it would be fair to admit: it hasn’t been a good year for several technology-related companies and its customers. 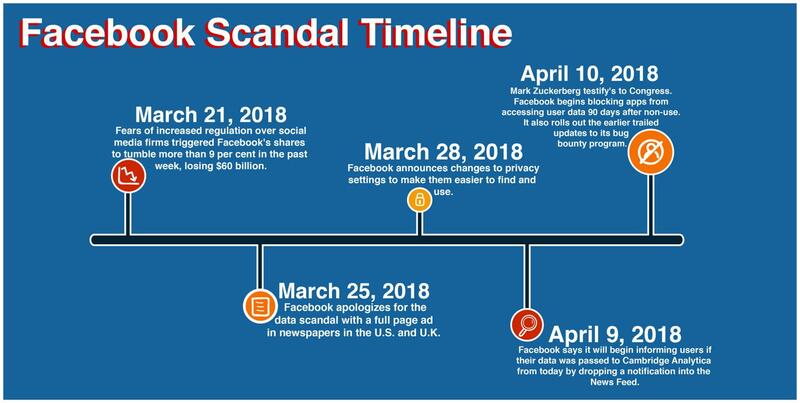 The year has been defined by numerous scandals in the tech world, and it’s time to recap some of them. March 2018 wasn’t the best month for Facebook, to say the least. You always expect the tech giant to show growth, instead, the company lost about $60 billion in capitalization. The reason for this was the colossal data leak of 87 million users – something that the company couldn’t get away with. As a result, each “leaked” user took “cost” about more than a thousand dollars as it became known that research firm Cambridge Analytica somehow secretly obtained user data and (allegedly) used it to help Donald Trump win the presidential race. The most scandalous thing about this is that Facebook could have known about data leakage, but did not do anything to prevent it. The result is a rapid drop in the value of the company’s shares, investigations both in the US and Europe, and a widespread contempt. According to the preliminary results of the investigation, Cambridge Analytica used illegally obtained Facebook data to place highly effective advertisements and influence the opinion of social network users. The stock market reacted in such a way to the blow to the reputation of the brainchild of Zuckerberg, which personal worth suffered the most from these actions. Twitter users reacted in a “Delete Facebook” campaign which gained popularity on the social network. The campaign is supported by Brian Ecton, one of the creators of WhatsApp, who left Facebook in 2017 and Elon Musk himself. Eventually, Mark Zuckerberg provided apologies, but the scandal is regarded as the biggest corporate betrayal in modern history. On December 5, Member of the UK Parliament, Damien Collins, published more than 200 pages of internal documents of the company, he had gained access to in late November. Documents include correspondence of top managers on the methods of monetization, cooperation with developers and handling user data. As you might have already guessed, in those documents things do not look good for Facebook either. That’s how Collins commented on the situation: “I believe there is considerable public interest in releasing these documents. They raise important questions about how Facebook treats users data, their policies for working with app developers, and how they exercise their dominant position in the social media market”. Ironic enough, but back in 2017, Mark Zuckerberg said his New Year’s resolution was “to fix Facebook”. Well, it turns like you have one more try to accomplish the task in 2019, Mark. 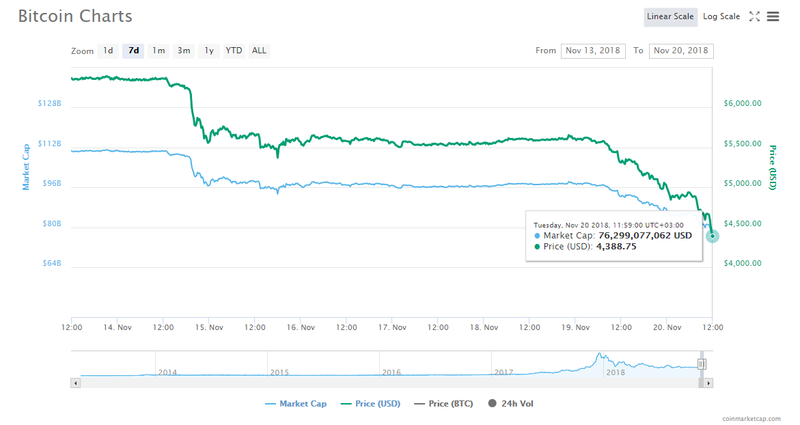 On the morning of November 25, Bitcoin was trading around $3.736, which is 13.77% lower than the previous day. In addition, the rates of most other cryptocurrencies have also reduced. In particular, Ethereum fell by 14%, and Litecoin fell by 12%. In general, the capitalization of the cryptocurrency market has fallen to $120 billion, which is the lowest figure for the year. As analysts of Forex Club Group have noted, the cost of Bitcoin is declining due to the market’s vulnerability to hacker attacks following the theft of more than $5.5 million from the mining giant Bitmain. Analysts say that the Chinese company filed a lawsuit in court on November 9, which caused the cost of most cryptocurrencies to decrease. A renowned crypto investor Barry Silbert considers what is happening now as “the surrender of cryptocurrency” because of the deep disappointment in cryptocurrencies’ progress, the fall of interest from traders and users. At the same time, the ambiguous and often negative position of American regulators is an additional pressure factor. One of the triggers for the collapse in the market could be the prospects for action by the US Securities and Exchange Commission (SEC) with dozens of cases against crypto exchanges blamed for distributing unregistered securities. The company hid a massive vulnerability in its social network Google+, which put in jeopardy 500 thousand of its users whose personal data could be allegedly compromised. The security breach itself is half the trouble as no ideal defence has been invented yet. However, in this story, the general public were outraged by the fact that Google (similar to Facebook) admitted the presence of vulnerability only following a data leak in the media – seven months after its discovery. Google made an official statement, in which it announced the complete closure of the Google+ social network due to its “low popularity”. As for the vulnerability, the company said that it “wasn’t necessary” to talk about it, because the company did not find no evidence of abuse, and therefore the threat was not critical. The fact that the breach could have hurt the company’s reputation is not mentioned in the report. Do you remember Google’s unofficial “don’t be evil” motto? Ah, good old days. In July, Uber HR Director Liana Hornsey resigned from her post following the investigations of racial discrimination cases within the company. According to Reuters, the resignation occurred owing to an anonymous investigation. Several Uber employees claim that Hornsey systematically rejected complaints of racial discrimination, the agency states. Hornsey was not only the director of human resources at Uber but also one of the leading representatives of the firm on matters of discrimination. She held this position for a year and a half. At the same time, if you read “2018 Diversity Update: Building a Better, More Inclusive Uber”, a document on racial and sexual diversity of employees, you may notice that on paper things look just fine. If you take a look at disasters from 2017, you’ll notice that things do not change a lot. It seems like security and data protection remain the biggest problems in the tech world. Well, they know their biggest task to work on in 2019, don’t they?